In treatment of cancers using electron beams, depending on the type and the shape of tumor, cast cerrobend alloy cutouts are used. Cerrobend is a fusible alloy usually containing of Tin, Lead, Bismuth, and Cadmium. We used the cadmium-free type. Dosimetry was performed in 100 cm source surface distance (SSD) and using a 10 × 10 cm applicator. 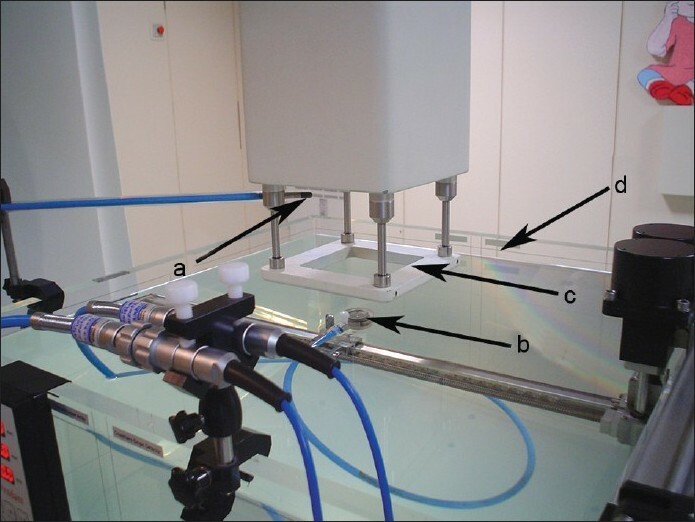 Dosimetry setup used for our work is shown in [Figure 1]. The PDD curve and output for the square, circle, and triangle cutouts and the 10 × 10 cm reference field was measured. The opening of X-ray jaws was 19 × 19 cm. 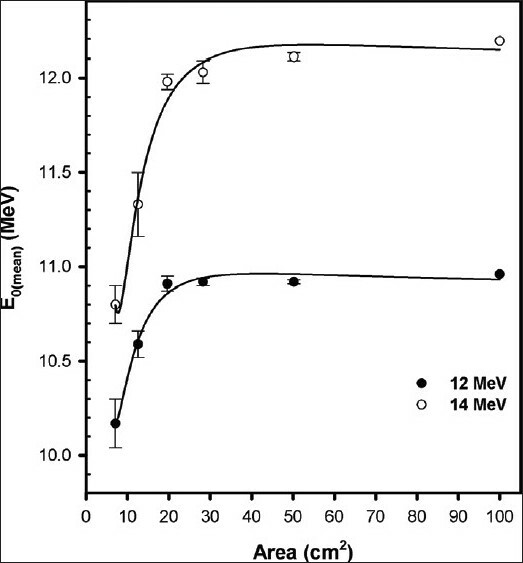 Linear accelerator used was a Siemens Primus model and the results were for the 12 and 14 MeV energies. The circle cutout diameters were 3, 4, 5, 6, and 8 cm. Squares had side lengths of 2.66, 3.54, 4.43, 5.32, and 7.1 cm. Also the equilateral triangles had 4.05, 5.4, 6.75, 8.1, and 10.58 cm side lengths. The cavity areas from the smallest cutout to the largest one for each shape were 7.06, 12.56, 19.62, 28.26, and 50.24 cm 2 , respectively. To obtain PDD both chambers were on. The obtained curves were the percentage depth ionization (PDI) and then converted to the PDD by MEPHYSTO® mc2 software. After the percentage depth dose curves were drawn, the information were extracted as R 100 , R 90, R 80 , R 50 , R 20 , R p , and E 0(mean) . For measuring the output, the plane parallel chamber was placed at the depth of maximum dose. The maximum depth dose was calculated for each cutout using the PDD curve, because the cutouts' d max are different to a 10 × 10 cm field. We measured the output after turning off the thimble chamber. The measurement was done four times for each field and the average was compared with the reference field (10 × 10 cm) output. 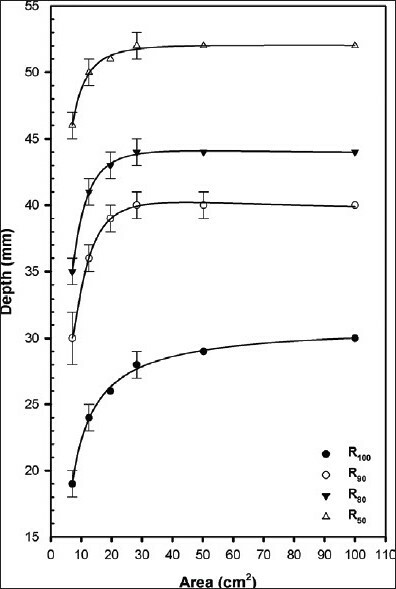 As is clear from [Table 1], shields cause more change in higher depth doses, especially R 100 , R 90 , and R 80 , and it has a little effect (up to 1 mm) on the R 20 , which is negligible. Triangular shields changed R 100 , R 90 , R 80 , and R 50 more than the circular and square shields. The reduction in R 100 in the triangle shield was from 27 to 18 mm, but for the circular and square shield it was from 27 to 19 mm. For circular and square fields larger than 28.26 cm 2 , due to the establishment of electron lateral scattering equilibrium effect there is no difference between the values of R 100 , R 90 , R 80 , and R 50 compared to reference field. Also, the mean energy of the electron field in smaller fields is lower. By fitting these values on the curve, we devised Eq. (4) (8) formulas to calculate the parameter change based on cutouts area. This formula is a Polynomial type, where S is the area of the shield cavity. Other methods, such as A/P  in which A is the area of the cavity and P is the periphery of the cutout hole, were not utilized due to the lack of favorable results in formulization. In the formula for E 0(mean), the fitted curve was a Sigmoidal (Gompertz) type. Here the R p was equal to 6.2 cm and the E p0 was 12.66 MeV. As a result R eq = 3.2 cm. PDD data for 14 MeV is demonstrated in [Table 2]. In this energy the highest change was observed in R 100 . Here again the decrease on R 100 , R 90 , R 80 , and R 50 by the triangular shields is rather than circular and square shields. 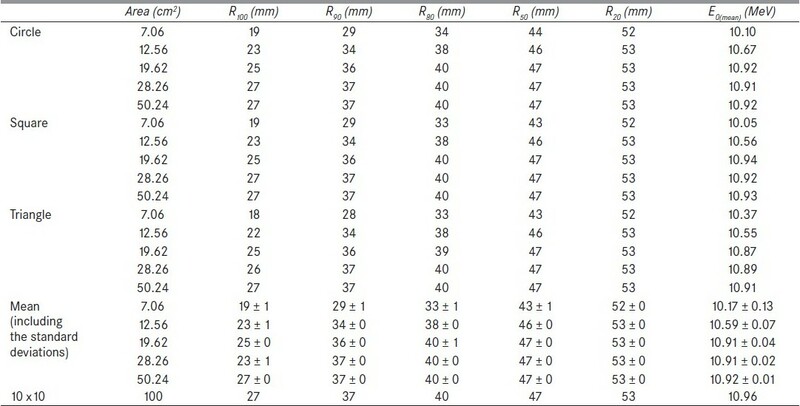 The R 100 for the circular shape decreased from 30 to 20 mm in comparison with the reference field. For the square cutout it changed from 30 to 19 mm and for triangle cutout it changed from 30 to 17 mm. The R 20 for the 7.06 cm 2 area for all fields reduced from 59 to 57 mm. In the largest area (50.24 cm 2 ) for 14 MeV in the circular and triangle fields the change of R 100 was 1 mm and for the square cutout it remained unchanged. For 14 MeV similar to 12 MeV the mean energy for smaller fields was lower than the larger fields. The maximum reduction in mean energy was for the triangle shape, decreasing from 12.19 to 10.71 MeV. [Figure 2],[Figure 3],[Figure 4] are obtained by fitting the Mean values of [Table 1] and [Table 2] on the curves. In these figures, the error bars represent plus and minus standard deviations for each point. 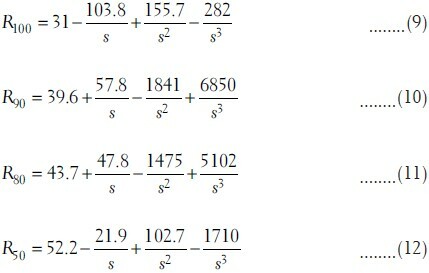 Some points have same value in several measurements, for these points the standard deviations are zero and no error bar exists. Dose rates in Gy/min were measured at the depth of maximum for all fields and then calculated as a ratio of the reference dose rate value to obtain the OPF for each shield. The dose rates were measured 4 times for each field. As the cutout area becomes smaller the dose rate and consequently the OPF for the circle, square, and triangle are reduced from 0.993 to 0.907, from 0.995 to 0.895, and from 0.992 to 0.891, respectively. The lowest output was observed for the triangle. Eq. (14) is a more general formula and can be used for all shapes. 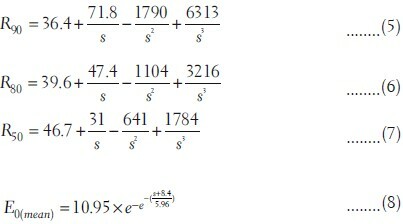 Eqs (14) and (15) are the formulas for the [Figure 5] curves, which were obtained from [Table 3] and [Table 4] data. The curves in [Figure 5] are very close together; hence the error bars have had overlap, so the error bars are omitted. 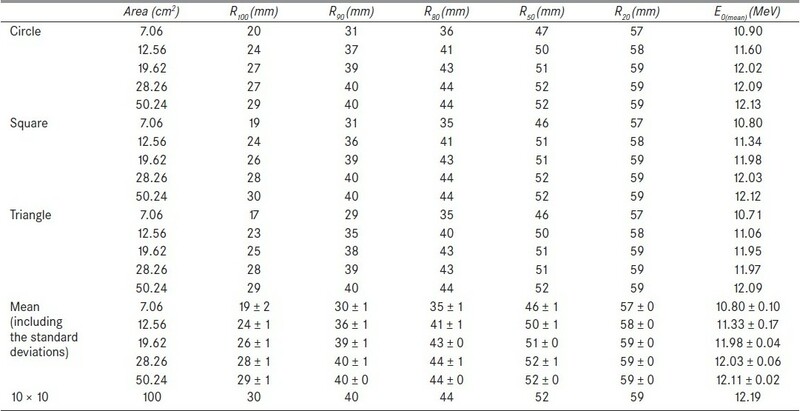 However, the standard deviations are available in [Table 3] and [Table 4]. Our findings are in line with the mentioned studies except that these studies have been limited to a particular shape (circular or square) and mostly for one energy level, and none of them have formulized the changes caused by using different cutouts. In 12 MeV and 50.24 cm 2 area for circular, square, and triangle shapes the values of R 100 , R 90 , R 80 , R 50 , and R 20 are equal to the values of the 10 × 10 cm field. 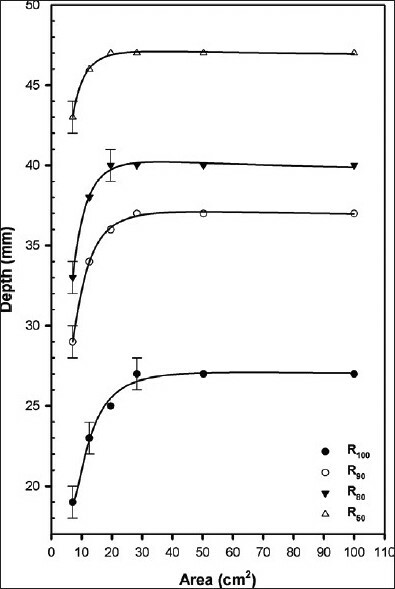 The most changes in PDD parameters was observed for the triangle shape, so that R 100 and R 90 for 7.06 cm 2 area were changed 1 mm more in comparison with circle and square shapes. 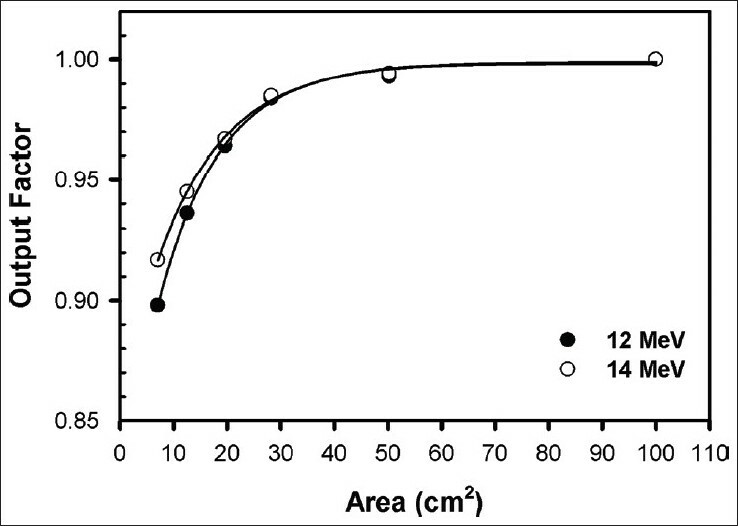 In 14 MeV, the minimum radius for establishment of lateral scatter equilibrium was increased. So, in the 50.24 cm 2 area, which had the largest radius, the R 100 for both the circular and the triangle shapes was different to the 10 × 10 cm field. For the triangle the R 90 , R 80 , and R 50 values were different from the 10 × 10 cm field. Here again the most changes in the values of R 100 , R 90 , R 80 , R 50 , and R 20 were observed with the triangle. E 0(mean) will decrease, if the cutout size is reducing. Whereas E 0(mean) is related to the R 50 , the reduction of R 50 would cause reduction in E 0(mean) as well. The minimum value of E 0(mean) in 12 and 14 MeV was achieved by using 7.06 cm 2 square and 7.06 cm 2 triangle cutouts, respectively, which was equal to 10.05 MeV for 12 MeV and 10.71 MeV for 14 MeV. The reason why the output and percentage depth dose for triangle are different to circular and square shapes is arising from the nature of the triangle which has smaller width of field in the corners in comparison to square and circle fields, which prevents the establishment of lateral scatter equilibrium more than circular and square shapes. It is clear that if we use smaller cutouts, in higher depth doses (R 100 , R 90 , R 80 , and R 50 ), more reduction of depth would be seen. , However, this reduction is much more tangible in the depth of R 100 and R 90. The output of the machine which is one of the most important factors in treatment, decreases with reducing the diameter of cutout. ,,, This reduction is more pronounced for triangles rather than circle or square. Also, the changes in PDD and outputs in clinical cases must be considered. For example, to compensate the changes of d max , the bolus might be used  and output changes should be considered in the treatment calculation. The formulas presented in this study, are clinically useful to calculate the changes of PDD and OPF for each regular and semi-regular geometry cutouts on the central axis. Knowledge of these variations might be effective in having an accurate dosimetry and treatment. We thank Dr. Kourosh Sheibani the chief researcher at Clinical Research and Development Centre, Imam Hossein Medical Centre, for his valuable assistance in preparing and revising the manuscript. We would like to appreciate Mr. Mehdi Goodarzi for editing some parts of the manuscript. 1. Su M, Li T, Tong S, Grant D, Farhangi E, Tapen E, et al. Small electron field cut-out output factors measured using a 2D ion chamber array compared to radiographic film. Vol. 32. 47th AAPM Annual Meeting; 2005 Jul 24-28; Washington, USA. Med Phys 2005. p. 2007. 2. Xu MM, Sethi A, Glasgow GP. Dosimetry of small circular fields for 6-MeV electron beams. Med Dosim 2009;34:51-6. 3. Bruinvis IA, Van Amstel A, Elevelt AJ, Van der Laarse R. Calculation of electron beam dose distributions for arbitrarily shaped fields. Phys Med Biol 1983;28:667-83. 4. Niroomand-Rad A, Gillin MT, Kline RW, Grimm DF. Film dosimetry of small electron beams for routine radiotherapy planning. Med Phys 1986;13:416-21. 5. Khan FM. The physics of radiation therapy. 3 rd ed. Philadelphia: Lippincott Williams and Wilkins; 2003. p. 292-4. 6. Khan FM, Higgins PD, Gerbi BJ, Deibel FC, Sethi A, Mihailidis DN. Calculation of depth dose and dose per monitor unit for irregularly shaped electron fields. Phys Med Biol 1998;43:2741-54. 7. Khan FM, Doppke KP, Hogstrom KR, Kutcher GJ, Nath R, Prasad SC, et al. Clinical electron-beam dosimetry: Report of AAPM Radiation Therapy Committee Task Group No. 25. Med Phys 1991;18:73-109. 8. Khan FM. The physics of radiation therapy. 3rd ed. Philadelphia: Lippincott Williams and Wilkins; 2003. p. 267-8. 9. Aggarwal LM, Oommen S, Parthiban V, Passi K, Vashistha R, Bhupinder S. Variation in electron output and percentage depth dose in presence of lead cut-outs in Mevatron-74. J Med Phys 1999;24:44-6. 10. Andreo P, Burns DT, Hohlfeld K, Huq MS, Kanai T, Laitano F, et al. Absorbed dose determination in external beam radiotherapy: An international code of practice for dosimetry based on standards of absorbed dose to water. IAEA Technical Report Series no 398. Vienna: International Atomic Energy Agency; 2000. 11. Niroomand-Rad A. Film dosimetry of small elongated electron beams for treatment planning. Med Phys 1989;16:655-62. 12. Sharma SC, Johnson MW, Gossman MS. Practical considerations for electron beam small field size dosimetry. Med Dosim 2005;30:104-6. 13. Zhang GG, Rogers DW, Cygler JE, Mackie TR. Monte Carlo investigation of electron beam output factors versus size of square cut-out. Med Phys 1999;26:743-50. Khaledi, N., Arbabi, A., Sardari, D., Rabie Mahdavi, S., Aslian, H., Dabaghi, M., Sheibani, K.